2017 has been a year of utter despair in light of countless human rights atrocities committed on multi-fronts. 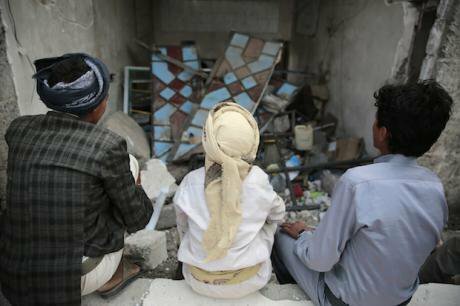 Boys sit on the rubble of a two-floor building destroyed by Saudi-led airstrikes on the northern outskirts of Sanaa, Yemen, 23 August 2017. Picture by Hani Al-Ansi/DPA/PA Images. All rights reserved.A U.N. official warned days ago that, “Yemen could be the worst humanitarian crisis in 50 years.” As 2018 begins, these words reflect the increasingly deteriorating unspeakable human suffering in Yemen, after the UN had been calling Yemen throughout last year as the largest humanitarian crisis in the world. The poorest Arab nation with a population of around 25 million has been sent into destitution after nearly four years of war. 2017 has been a year of utter despair in light of countless human rights atrocities committed on multi-fronts; from the Saudi-led coalition to Saleh-Houthis’ forces and the U.S. counter-terrorism military operation, all sharing responsibility for creating unspeakable human suffering in Yemen. However, the killing of Saleh at the end of 2017 marks a historical transition that’s going to drastically change Yemen’s political map for years to come. Saleh’s violent death gives a glimpse into the gruesomeness of this war. Both combatants and noncombatant innocent civilians are caught up in the violence. While Houthis’ (and Saleh’s for a certain time, until his death) forces in Taiz continued their indiscriminate shelling or, as described by the UN Human Rights Office, the “unrelenting shelling,” against civilian inhabited areas for about three years, resulting in a terrible death toll, the Saudi-led coalition airstrikes since 2015 did not cease to hit non-military populated areas across many parts of Yemen. In 2017, markets, a migrant boat, a local inhabited hotel, among many other non-military targets were hit. The glaring example last year, however, was the story of the five-year-old Bouthina who survived an attack in August by Saudi-led coalition airstrikes hitting an apartment building in Sana’a, killing all her family. The Yemen Data Project reveals that since 2015 nearly one-third of Saudi air raids hit non-military sites in Yemen. To rub salt into the wound, 2017, in particular, was when more US strikes hit Yemen than the past four years combined, with 125 strikes, under the U.S. war-on-terror military operations. Another glaring example of that was the U.S. Special forces’ first raid in Yemen’s al-Baydah province under U.S. president, Donald Trump, end of January 2017, killing dozens of women and children. In parallel, Yemenis face a humanitarian catastrophe as the country's infrastructure is almost totally destroyed and humanitarian operations don’t have full access to some of the hardest hit communities in Yemen, following the Saudi-led coalition imposing a siege, in retaliation to a Houthi-fired missile hitting close to Saudi Arabia’s Riyadh airport in November. Despite progress in Saudis promising to open Houdaidah port and letting Aden port open, the humanitarian situation seems to be only worsening, proven by the UN’s recent announcement of the largest-ever emergency relief allocation - $50 million for UN aid-operations to come forward in 2018. This doesn’t reflect a success but rather an indication of how desperate the humanitarian situation is. The current number of reported civilian casualties seems illogical given the conflicting reports from the U.N. that are not matching the scale of human suffering on the ground. More than a year ago, a UN official revealed that 10,000 civilians have been killed in Yemen but another recent UN report claimed that only 5,000 civilians have been killed since March 2015. As widespread famine threatens millions of lives, there is a new outbreak of disease, diphtheria, in addition to cholera; that’s probably the worst outbreak the world has ever seen, ripping more than 2,000 lives and reaching one million suspect cases. Also, UNICEF has been reporting since the beginning of 2017 that every 10 minutes a child dies in Yemen. In a situation like this, looking like the apocalypse, reports failed to match the real death toll throughout 2017. While Yemenis are still counting the dead, the only slight of progress ever made in September 2017 was the establishment of an independent investigation committee by the UN Human Rights Council into the war crimes, thanks to great pressure and advocacy work done by international and local Yemeni Human Rights organizations since 2015. This is significant because campaigning clearly pays off and local and international civil society efforts in Yemen do matter. Nonetheless, the committee is due to begin its work later this year. By December 2017, a political earthquake was to hit Yemen. Saleh’s death at the hands of the Houthis marked a violent end for an era and a defining point in Yemen’s political map. As ensuing days warring parties’ military operations intensified, Saleh’s death posed two critical aspects. One is that, whether Saleh genuinely desired to initiate negotiations away from Houthis or him forseeing the deadly path of his alliance with the Houthis, it’s confirmed today that Houthis’ politics are driven by violence. The other aspect is, in spite of Houthis’ violent politics, Saleh’s absence has created for the first time in the course of Yemen’s nearly four years of war, one single centralized power in the north part of Yemen; that’s in the hands of the Houthis. Now more than ever, there has to be a regional and international political will to face this centralized power, reinvent a political solution and resolve the conflict. Unfortunately, this is unlikely to happen as in 2017 alone, both key international allies to Saudi Arabia; the US and the UK have found Yemen's war to be a lucrative business, profiting massively from the financial rewards of their arms sales to Saudi Arabia. With a tragic optimism, let us hope 2018 would bring the political will to end the Yemen war.